GPs are at the forefront of cancer diagnosis. But with increasing pressure on primary care it is difficult for GPs to always recognise the symptoms and take the appropriate action. To support GPs with their ever increasing workload we are piloting initiatives to help GPs better recognise the signs and symptoms when the patient is in their practice. 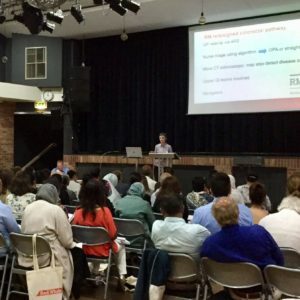 We also funded four education events for GPs, run by Red Whale GP Update, to provide primary care professionals with the latest evidence of cancer diagnosis. RM Partners is supporting a pilot in three boroughs in south west London that uses an award winning AI decision support tool, C the Signs, to help GPs identify patients at risk of cancer earlier. The app, which can be used on desktop computers or mobile phones, uses artificial intelligence mapped with the latest NICE guidelines and other evidence to provide GPs with the ability to check combinations of signs, symptoms and risk factors in an easy-to-use format. Designed to be used within a GP consultation, it supports clinicians in recommending what investigations or referrals the patient may need. GPs can search by symptom or area of the body affected and will then be shown each diagnostic pathway. The pilot is being run in Merton, Sutton and Wandsworth, with GPs and practice nurses in 95 practices given access to the tool and able to use it in consultations with their patients. 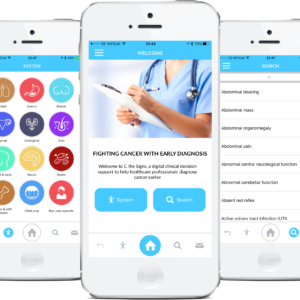 The project will run until March 2019 and will be evaluated using GP feedback and referral conversion rates of cancer, together with emergency presentations of cancer. It is envisaged that this will be further rolled following proof of concept. RM Partners is supporting a small pilot project in Sutton to help GPs to better identify suspicious skin lesions and increase appropriate referrals. The approach involves the use of dermatoscope technology, as well as an intensive training programme at the skin cancer clinic in Epsom and St Helier NHS Trust to ensure more appropriate referrals are being sent to the Trust. Working with the lead dermatology consultant at Epsom and St Helier University Hospitals NHS Trust, the GPs will be trained in the use of a dermatoscope and attend skin cancer clinics at the Trust to help them better distinguish benign from malignant lesions. Dermatology referrals from the practices where GPs received training will be audited to determine if more appropriate referrals are being made. The aim is to have a 10% reduction in the number of outpatient appointments for suspected skin cancers from these practices. If successful, the pilot could be rolled out to other boroughs across west London. Safety netting encompasses a range of methods, including verbal, written and electronic. Historically, GPs have implemented verbal and written safety netting methods. There is currently wide variation in approaches and practices are asking for practical solutions about how to safety net. RM Partners is currently piloting an electronic cancer safety netting tool, with the aim of ensuring that patients at higher risk of cancer are monitored and followed up to reduce the number of emergency presentations, and to increase the number of cancers detected at an earlier stage. We have hosted learning workshops for GPs in Brent, Harrow and Hillingdon CCGs taking part in the pilot, to show them how to safety net in their practice by using existing electronic tools on their systems. Additionally, an online tutorial has been produced for these practices to provide further information to help improve confidence in using EMISweb for safety netting.